Fantastic soundtrack. Amazing characters. Gateway series. Masterpiece. These are only a few of the praises heaped upon Sunrise’s 1998 animated classic Cowboy Bebop, which was directed by the now legendary Shinichiro Watanabe. I don’t think I am ruining anyone’s suspense by saying that I believe it deserves every single one of them. We will get a bit more into this later, though. 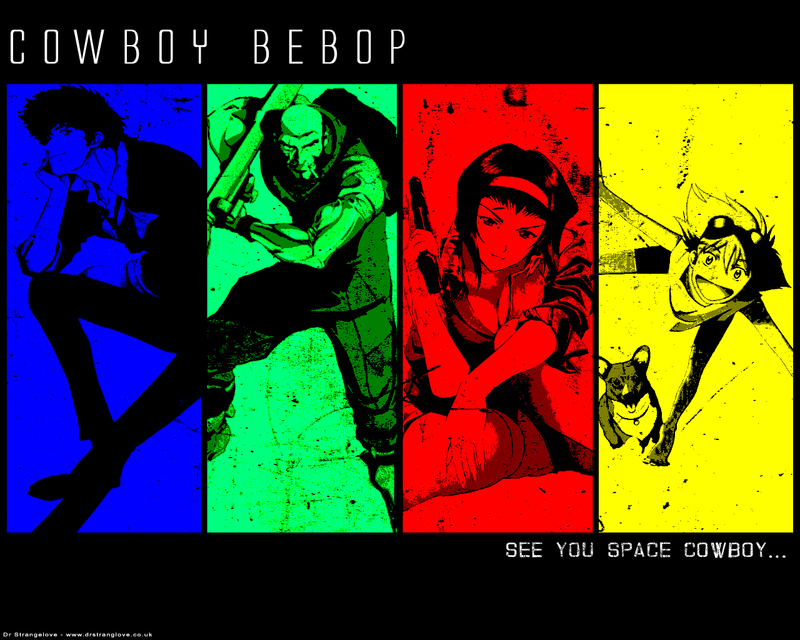 In case you are not yet familiar with Cowboy Bebop, the series is a sort of film noir/western thing set in space. Our main character Spike Spiegel works with his friend Jet Black as bounty hunters. Over the course of the series they pick up new companions, namely Faye Valentine, an amnesiac with a love for both money and conning other people out of it; and Edward, an androgynous girl with an incredibly long and practically unpronounceable middle name who is a genius hacker. Lastly there is Ein, a dog with very high intelligence. Most of the episodes are self-contained, episodic stories, all packed with creativity and never feeling boring. However, there is an overarching plot concerning Spike’s past work with a man named Vicious. Both of them used to work for a criminal syndicate and the reason for their falling-out that made Spike leave said syndicate is one of the main lynchpins of their story. This ties into a criticism of the show I have: While the first episodes are indeed entertaining, the main plot only kicks off in the fifth episode where Spike meets Vicious, Ballad of Fallen Angels. Fortunately, the episodes that don’t directly deal with Spike’s past can easily stand on their own. From the little boy in “Sympathy for the Devil” who is more than he seems at first glance, the match between Chessmaster Hex and Edward in “Bohemian Rhapsody”, the absolutely superb “Speak like a Child”, the insane child-like assassin in “Pierrot le Fou” and the fascinating philosophical themes in “Brain Scratch”, there is not one dull moment to be found. The series is only enhanced further by the excellent soundtrack by famous composer Yoko Kanno. Her soundtrack was one of the first things from Cowboy Bebop to be created, and thus heavily influenced how it was realized. According to Watanabe, he derived some of his inspiration for the series by listening to the songs she made and then developing scenes that fit them. One cannot praise the music in Cowboy Bebop highly enough. Several of the songs have become iconic in the anime fandom and beyond, such as the incredibly catchy and energetic opening theme, “Tank!”. I could continue singing the praises of this show like the quality of its English dub, but there wouldn’t be much point to it. Everything positive you can say about it has already been said and said often. Cowboy Bebop has received universal acclaim by critics – even otherwise contrarian ones – and is one of the best and most influential anime series ever created. If you consider yourself an anime fan, you owe it to yourself to watch this series. If you want to get into anime, this show is a great starting point and shows wonderfully why anime is worth watching, despite the many bad series that plague the genre. Lastly, even if you don’t like anime, give it at least a shot. There are people who absolutely despise the medium yet still love Bebop. Masterful storytelling transcends genre and medium. A fantastically written story with great characters. The animation still looks great even today and has a unique style. Great gateway series and an absolute classic. The series takes a bit to go from good to great. Some episodes are not quite as memorable as others.